Party of Regions faction leader Oleksandr Yefremov has said that members of his faction will participate in the drafting of amendments to the Constitution of Ukraine and that the new version of the country's main law could be adopted no earlier than September this year. "Representatives of our faction will participate in the drafting of this document, and we will definitely vote for the version that will be agreed upon," he said at a briefing on Thursday. 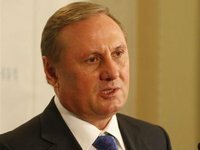 At the same time, Yefremov added: "We see it this way: in September we should bring the country's main law into line with the provision that currently corresponds to our society." He said that the legitimate procedure for amending the constitution was impossible to complete before September.